You can now add Kaiju Addicts to your list of places to get X-Plus Toho Godzilla Vinyl Figures! …Well, sort of. I actually made them available from the family business: Flossie’s Gifts and Collectibles. “Flossie” is my mother. She’s been providing cutesy, girly stuff like Precious Moments and plush bears successfully online now for over 15 years. Now we can X-Plus Toho Godzilla Vinyl Figures to that line-up! I personally take care of ordering from the distributor, caring for the products at our warehouse, packing and shipping and, most importantly, I’m available via email to answer any questions on your order or in general. You can reach me at or . I hope you give Kaiju Addicts and Flossie’s Gifts & Collectibles a chance to be your source for X-Plus Godzilla Diamond Reissues. I have been and will continue to be aggressively keeping track of new X-Plus production batches as they become available and adding them to our online shop. 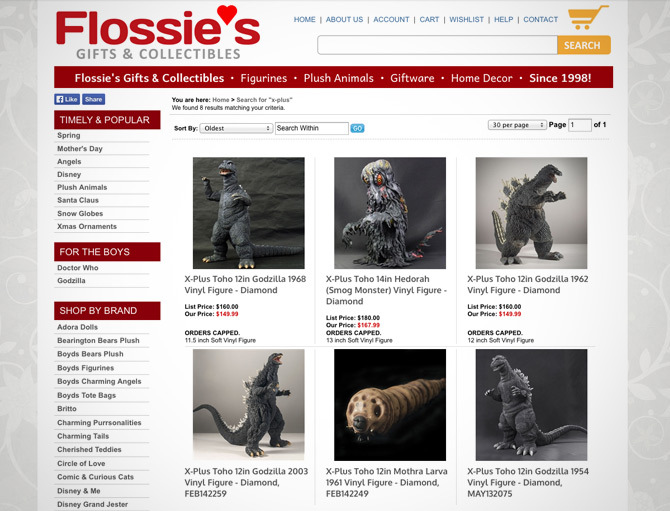 Click here for X-Plus Godzilla Vinyl Figures at Flossie’s Gifts! We also carry Godzilla and Godzilla 2014 products from other lines such as S.H. Monsterarts, NECA, Jaks Pacific and more. I also hand-picked a selection of awesome Doctor Who and Ghostbusters collectibles. Monsters & More at Flossie’s Gifts & Collectibles.